So much to do, yet so little time. And with many modern families scattered across the globe, is it any wonder that an increasing number are forsaking the long trek home, opting instead to meet up with their loved ones in an exotic location? With that in mind, Thai hotel group Anantara has just launched a six-sleeper Family Suite at its Elephant Camp & Resort in the country’s Golden Triangle region. 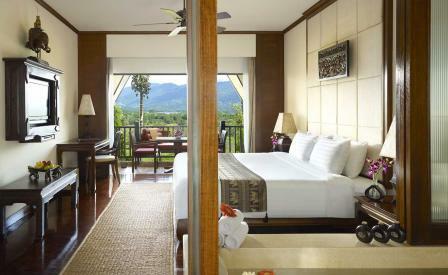 Perched among lush rolling hillsides, where the Ruak and Mekong Rivers meet, the villa is made up of two parts – a Deluxe View Room which interconnects with a View Suite, both with balconies and built-in daybeds from which to admire the bracing views of Thailand, Laos and Myanmar. The interiors are a modern take on the brand’s signature Thai aesthetic, with rich silk textiles and hardwood teak flooring forming the base for traditional timber furnishings and indigenous tchotchkes. With a range of activities surrounding the onsite elephant camp, there is plenty to do as a family en-masse. We suggest a leisurely stroll with the gentle giants and their mahouts on their daily walk, followed by a private dining experience in the baby elephant camp.